Map of the coral reefs around the southern islands of Singapore (Courtesy of the Tropical Marine Science Institute). Published in Loh et al. (2006). The coral reefs in Singapore are found skirting many of the islands south of mainland Singapore. These comprise fringing and patch reefs. See coral cover by island. 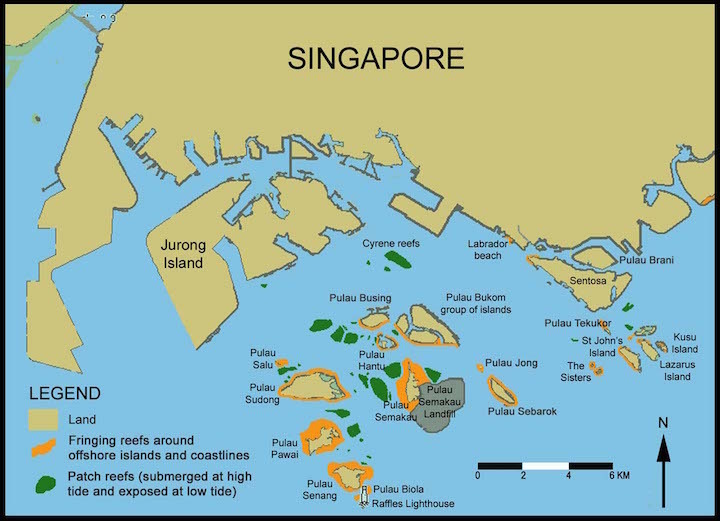 There were once over 60 offshore islands and patch reefs around Singapore, most of which were situated south of mainland Singapore. However, since the mid 1970s, major land reclamation was carried out on the mainland as well as the offshore southern islands. Most of the southern islands were reclaimed, adding 1695 ha to Singapore's total land area. Some islands were merged as a result. The reef flats of many islands, e.g. Pulau Sudong, Pulau Hantu and Kusu Island were reclaimed right up to the reef slope. Many of the coral reef organisms were smothered by the reclamation, while others were severely affected by the resulting increase in water turbidity. Since 1986, most coral reefs in Singapore have lost up to 65% of their live coral cover (Chou 2006, 2008). The high turbidity of our waters restrict light penetration and reef life ends at a depth of only 12 m, marking the lower growth limit for hermatypic corals. Sedimentation rates ranged from 3 to 6 mgcm-2day-1 in 1979. In 1994, these increased to 5-45 mgcm-2day-1 (the higher value obtained from localised areas close to reclamation projects). This reduced visibility from 10 m in the 1960s to 2 m or less today. As a consequence, the reef is very compact, as opposed to reefs in clear waters, which can be found at depths of 20 m and more. Contrary to the popular belief that our coral reefs have low biodiversity, they actually support a rich assemblage of marine fauna and flora. The reefs in Singapore has historically hosted 255 species of hard corals from 56 genera which, given the size of the reefs and conditions here, compare favourably with coral species richness in more extensive reefs of the region (Huang et al. 2009). Singapore reefs sustain good diversity of other marine organisms too, such as gorgonians (Goh et al. 1997) and nudibranchs. So far, 111 reef fish species from 30 families have been recorded. Please take a look at our photo and video gallery to see more. The reef in Singapore can be subdivided into three main zones: the reef flat, reef crest and reef slope. The shoreline gives way to the shallow reef flat that may vary in width and depth--at very low tides, some parts of the reef flat are exposed to air and direct sunlight. Here, scattered about are small colonies of boulder-shaped knob corals (Dipsastraea), maze coral (Platygyra) and sponges of different colours. Pockets of sandy areas may be surrounded by lawns of large brown algae Sargassum sp. Bands of black sea urchins gather in large numbers. This level also marks the outer edge of the reef flat, which gives way to the reef crest. Marine life on the reef crest is usually the richest. Almost every type of coral is represented: the brain corals (Lobophylliidae), bubble corals (Euphylliidae), pore corals (Poritidae), mushroom corals (Fungidae), cauliflower corals (Pocillopora), cave corals and disc corals (Dendrophylliidae), the table and staghorn corals (Acropora), anemone corals (Goniopora)and many others. Living among them are many other marine animals. Deep purple-coloured sea anemones, with their symbiotic clownfish are a common sight. Feather stars (Crinoidea) are cryptic by day, and hide in coral crevices. Attached on the reef substrata are the sponges (Porifera), sea squirts (Tunicata), feather-duster worms (Sabellida) and stinging hydroids (Hydrozoa). The other more mobile reef residents are the cowries, cone shells, nudibranchs, shrimps and crabs, which may be found in the crevices of the reef. No other marine habitat supports such numbers or diversity of fishes as coral reefs. Most reef fishes adopt bright colouration, curious body shapes and habits. They not only add much vibrancy to the reef, but also are important contributors in almost all levels of the coral reef ecosystem. The most diverse and abundant fishes on Singapore reefs are the damselfishes (Pomacentridae) and wrasses (Labridae). Other common reef fishes are the copperband butterflyfish (Chelomon rostratus) and vermiculated angelfish (Chaetodontoplus mesoleucus). Some of the reef fishes are economically important as food fish. These include the groupers (Serranidae), snappers (Lutjanidae), scads and trevallies (Carangidae). As the upper reef slope gives way to the lower reef slope at about 7 to 8 m depth, the density of marine organisms decreases. Coral boulders are scattered, separated by coral rubble, sand and silt. Occasionally, one comes across some sea urchins, crinoids, gobies, goatfishes and mushroom corals, cup sponges and brilliantly coloured sea fans. 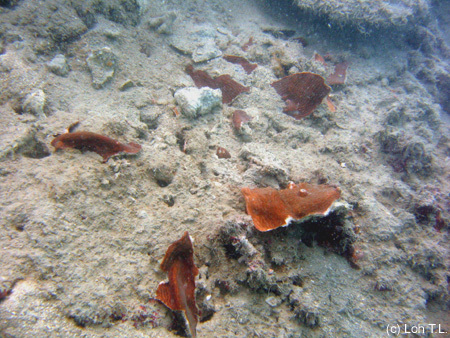 The sea floor of many reefs in Singapore is usually silty. Long sea whips and smaller sea fans are common. A few isolated colonies of corals still grow at these depths, but most of these are ahermatypic (do not possess symbiotic zooxanthellae), and hence able to colonise the darker parts of the reef. The most significant cause of reef degradation in Singapore is sedimentation. Land reclamation, dredging of shipping channels and dumping of earth spoils, have increased the sediment load. Loss of coral reefs to land reclamation have occurred along the southwest coast of the mainland and on several of the offshore southern islands. Increased sedimentation have affected the remaining reefs in two ways: (1) by causing a slow but steady reduction in live coral cover, and (2) by reducing the lower depth limit of coral growth on reef slopes. Surveys since 1986 indicate that live coral cover have decreased by up to 20% on some reefs, although other reefs register no impact. The reduction in sunlight penetration have furthermore reduced the lower depth limit of coral growth. In the 1970s, coral growth extended to 10 m down the reef slope. Today, growth is restricted to 6 m although some coral species still occur at the 8-m depth. Accidental oil spills remain an ever-present threat. However the 1997 Evoikos oil spill (27,000 tonnes) did not seriously affect coral reefs, although oil contaminated the upper parts of some reef flats. Other activities that also have an impact on the reefs include recreational and tourist-related use. Negligent or inexperienced divers without proper buoyancy control leave a trail of broken corals. Anchor damage is caused by fishing boats and pleasure craft. 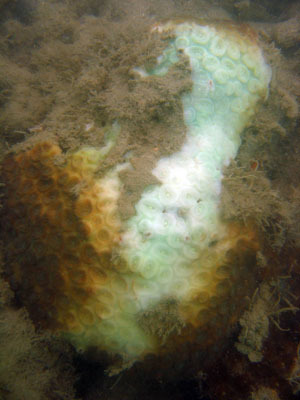 Careless diving or boating activities can severely damage fragile, slow-growing corals! Practise good buoyancy control, and leave reef organisms where you find them! As with coral reefs around the world, Singapore reefs suffered a mass bleaching event in June 1998 and again in June 2010. Sea temperatures around Pulau Hantu and St John's Island were elevated by 1-2 degrees C from March to June 1998. 50-90% of all reef organisms in Singapore were affected, particularly the hard corals, soft corals and anemones. The bleaching effect extended to 6 m, the lower growth depth limit for coral growth locally. Sea temperatures returned to normal in August 1998. A study of the stressed colonies was undertaken during this period. 10 out of 35 coral colonies died from the stress, and the genera Sinularia and Euphyllia were most affected. Other colonies showed various signs of stress, such as growth of turf algae and silt accumulation, leading to partial mortality. Many thanks to Ria Tan for help with initial web design and photos, as well as past and present members of the Reef Ecology Study Team, especially Tse-Lynn Loh and Jeffrey Low.